Although the change might have been slightly jarring at first, it actually signaled a major stepping-stone in the College’s increasing sustainability efforts. Since 2010, various campus green spaces have been transitioning from conventional to organic lawn treatment, using an all-natural approach rather than synthetic pesticides and fertilizers. The food industry has long been moving in an organic direction, but the organic trend hasn’t caught on as rapidly with those who tend recreational surfaces, like lawns. 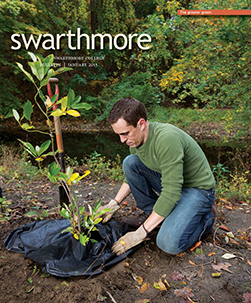 At Swarthmore, one of the first institutions to make a transition of this sort, grounds and arboretum staff have been inspired, in part, by leaders of other innovative public projects. “About 80 acres of the gardens and parks in Philadelphia are maintained organically by the Pennsylvania Horticultural Society’s Philadelphia Green program,” says Jeff Jabco, coordinator of horticulture at the Scott Arboretum and the College’s director of grounds. Jabco and other College employees interested in that program also investigated a soil-restoration project at Harvard University and one at the Battery Park City Parks Conservancy, which is all organic. After Jabco worked with the Harvard project’s director, the next steps for Swarthmore became clear. “We already have leading sustainability initiatives, like green roofs on several dormitories, so this transition seemed necessary,” he says. Although the organic approach has been implemented on approximately 6.33 acres of campus lawn thus far, perhaps the most notable aspect of this work is taking place on Parrish Beach, a focal point for the project. Selby, a key leader of the transition, has been a gardener with the College for six years. She contributes much past experience combined with a personal interest, which began in her student days. One of the key components of the organic lawn initiative was involvement and support from students and faculty. Several current students were involved with the transition to organic. The project’s presence fits in with an overall mission to make the school a model of a more environmentally conscious society. 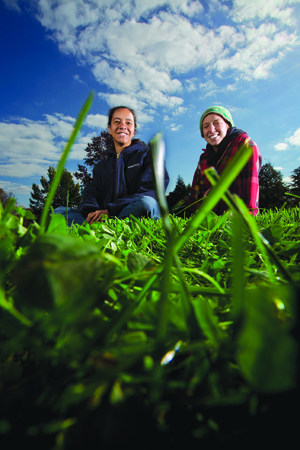 “Our organic lawn trials serve not only to improve our own ecological footprint but to educate and inspire other institutions to make strides,” says Selby. “The environmental benefits are magnified by raising awareness among our students and the local community and, hopefully, influencing their decisions as homeowners, consumers, and leaders in their professions.